Next up in our series of Global Waste Investment Fact Files is the Algeria edition. AcuComm currently lists ten waste projects in the country, with a total value of US$495 million, or US$50 million each. Recycling is the leading project type, accounting for US$313 million, or 63% of the total. This is followed by gasification, which accounts for US$140 million or 28% of the total. The total estimated capacity of these projects is 1.4 million tonnes. This is equal to 138,141 tonnes per project on average. This capacity is equal to 14% of Algeria’s estimated annual waste generation, at 9.6 million tonnes or 231kg per person. Waste investments totalling US$356 million are expected to become operational over the next few years. This is currently expected to peak in 2020 at US$189 million. For more details on the Algerian Fact File, click here. Alternatively, you can take a look at the latest projects in Algeria by clicking here. This month, the Development Bank of South Africa (DBSA) invited service providers to tender for appointment of Transactional Advisor for the City of Johannesburg (CoJ) Waste-to-Energy PPP Project. Growth in the city has led to the amount of waste being generated to escalate, with landfills reaching maximum capacity. The scarcity of suitable land has meant that it’s not easy to develop new sites, which has resulted in the initiation of a project to explore the feasibility of using alternative technologies. For a detailed summary of this project, it is now available to access in full for the next 7 days. Click here to make sure you don’t miss out. In March 2017, a proposal was submitted by Benguet Corporation for the final rehabilitation of one of the Antamok open mines, incorporating an engineered sanitary landfill and a waste-to-energy (WtE) facility. The proposed landfill would have capacity of 535,400 cubic metres and would receive 150-200 tonnes of waste per day from the surrounding areas of La Trinidad, Itogon, Sablan, Tuba and Tublay. Any combustible waste will be diverted to the WtE plant. Operations have been started up by SUEZ NWS on the third line of a hazardous WtE plant in the Shanghai Chemical Industrial Park. A new R&D centre dedicated to optimising energy recovery from hazardous waste was also unveiled. The third line, aimed at doubling the plant’s capacity to 120,000 tonnes of waste per year, represents an investment of €48 million. This project can be accessed by clicking here. Elsewhere, SUEZ NWS has also opened a new hazardous WtE plant in the Nantong Economic Technology and Development Area. The plant has capacity of 30,000 tonnes per annum for the treatment of locally-generated hazardous waste, as well as 3,300 tonnes for the treatment of medical waste. If you’d like to catch up on this project, click here. This month, a new medical waste incinerator was officially inaugurated in the Al Jarf area of Ajman. Clinical waste from around 120 hospitals, clinics and medical universities will be collected and burnt in a safe way that does not pose any danger to human health. For more details on this facility, the information is now available to access in full for 7 days. To make sure you don’t miss out, click here. The European Bank for Reconstruction and Development (EBRD) has disclosed a Project Summary Document (PSD) for the Puhovichi Solid Waste Project in Druzhnyi. The EBRD is proposing to provide €5 million sovereign loan to the Republic of Belarus for the first landfill in the country that will be compliant with EU regulations. On top of this, a new waste sorting facility will also be developed and investments will be made in vehicles and equipment to improve the waste collection system. Only in the proposal stages, your organisation could be among the first to get involved with this project. It is now available to access in full from our Business db, and you can do so by clicking here. A new plastics recycling plant has started operations in Norilsk, the world’s northernmost settlement. The facility will process up to 320 tonnes of plastic waste each month, including bags, packaging and disposable tableware. Costing approximately RUB 119 million, the facility will receive waste from the Tarko-Sale sorting complex. For more details on this project, you now have 7 days to access it in full. To make sure you don’t miss out, click here. 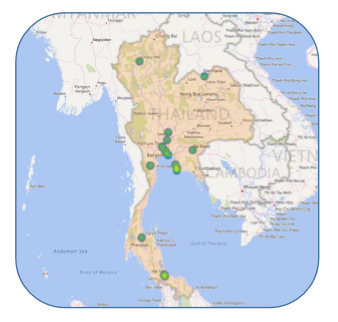 Next up in our series of Global Waste Investment Fact Files is the Thailand edition, where AcuComm currently lists 23 waste projects. These have a total value of US$1,644 million, or US$71 million each. 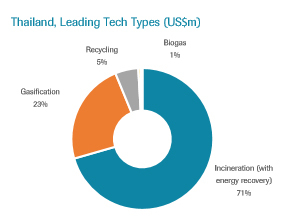 Incineration (with energy recovery) is the leading project type, accounting for 71% of the total. This is followed by gasification, which accounts for 23% of the total. The total estimated capacity of these projects is 4.3 million tonnes. This is equal to 186,521 tonnes per project on average. 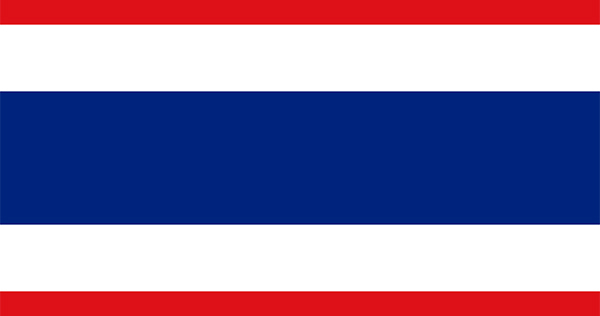 This capacity is equal to 28% of Thailand’s estimated annual waste generation, at 15.2 million tonnes. Waste investments totalling US$1,565 million are expected to become operational over the next few years. This is currently expected to peak in 2018 at US$548 million. To see the full list of projects we currently have in our Business db database, click here. This month, SUEZ NWS started up operations on the third line of a hazardous waste-to-energy (WtE) plant in the Shanghai Chemical Industrial Park (SCIP). The company also unveiled a new R&D centre, which is dedicated to optimising energy recovery from any hazardous waste. Up to 3% of revenue from the energy plant will be invested in the centre. Construction was started in September 2015, aiming to address the continued growth of the industrial park by doubling capacity to 120,000 tonnes of waste per year. For the latest on this project, it’s now available to access in full for 7 days. To access the most recent updates and the decision-maker contact details, click here. 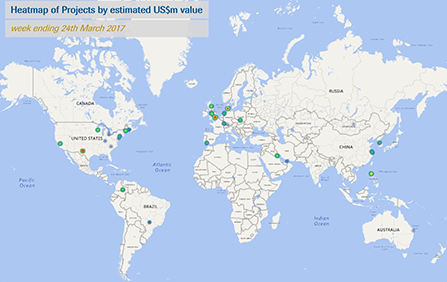 In the week ended 24th March 2017, AcuComm added 45 new or updated waste projects to our Business db database, worth an estimated US$5,423 million and feedstock capacity of just under 11 million tonnes. This takes the total estimated investment value of projects to US$367.6 billion. The estimated power generation from these projects was 1,088 MW. WtE incineration was the largest category, accounting for 791 MW. The leading country in the past week was the USA with seven projects. This was followed by the UK with six and China with five. Whether you’re looking to grow sales or define your strategy, or even both, AcuComm’s practical and strategic information about new projects could help your organisation make the necessary forecasts for your future business decisions. To find out how access to our projects database could benefit your organisation, book a demo with the team today. Prince William County’s (PWC) Solid Waste Division is planning to build a US$10 million organic waste processing facility. PWC has told AcuComm that work is expected to begin in Q2 of 2017, while the compost system is due to come online in Q1 of 2018 and the anaerobic digestion system following in Q3. Lietuvos Energija and Fortum Heat Lietuva’s joint venture, Kauno Kogeneracinė Jėgainė, has awarded contracts to Baumgarte Boiler Systems, Siemens, LAB SA, Konecranes and AF-Consult for the engineering, procurement and construction management of a €150 million, 24 MWe/70 MWth WtE/biomass plant in Kaunas. To keep-to-date with the latest from this project, click here.